Room: I have been majorly smitten with this Zebra print wallpaper ever since Wes Anderson introduced me to it in the Royal Tenenbaums. Years later, I still cannot get over the Scalamandre design. 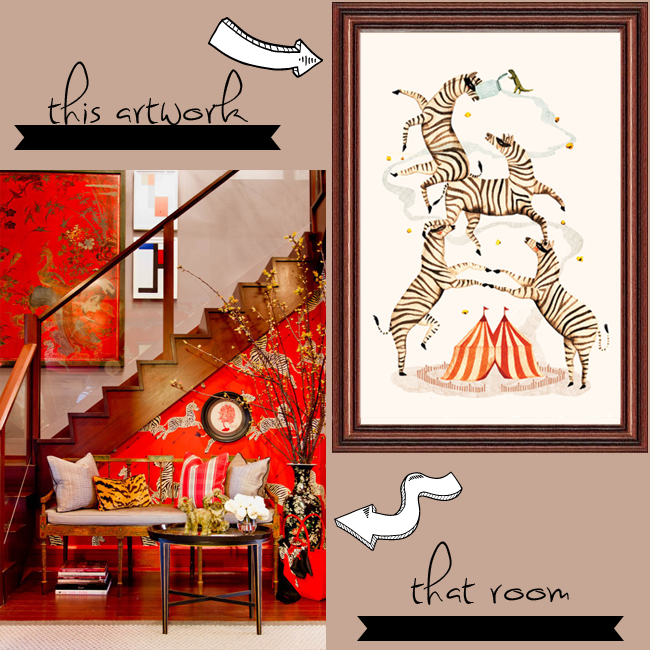 The eclectic, vermillion, safari-inspired foyer was created by Rikki Snyder. Artwork: Zebra Bandits by Andrea Wan by the Working Proof. This piece was originally illustrated to accompany a short children’s story published in Nido, a German parenting magazine. The story is about a small lurch who saved the smell of the circus from a group of Zebra bandits. The giclee print also serves a humanitarian purpose – 15% of of the gross sale of this print goes to: Médecins Sans Frontières / Doctors Without Borders. Room: Designer Elizabeth Dinkel’s choice of twin beds for Her Guest Room have a mystical yet feminine quality. 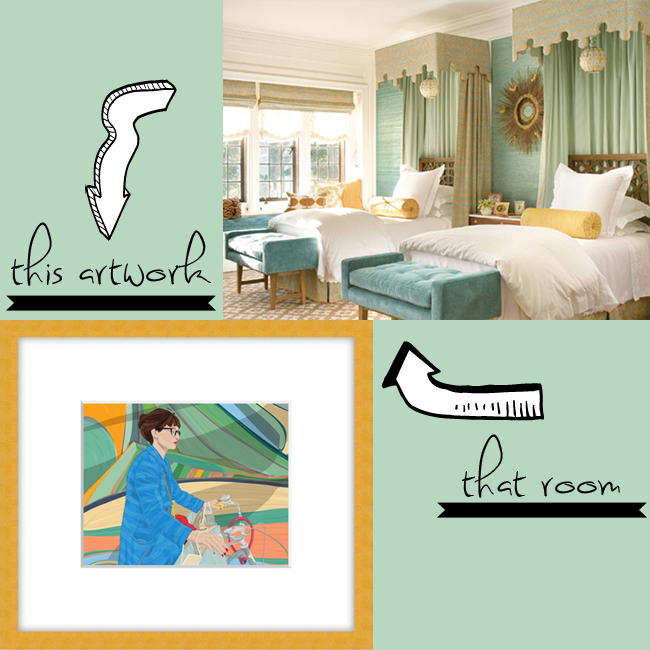 The room’s teal design veers towards a fashion-forward approach – with detailed tailoring and velvet textures punched up with exotic Moroccan trappings. 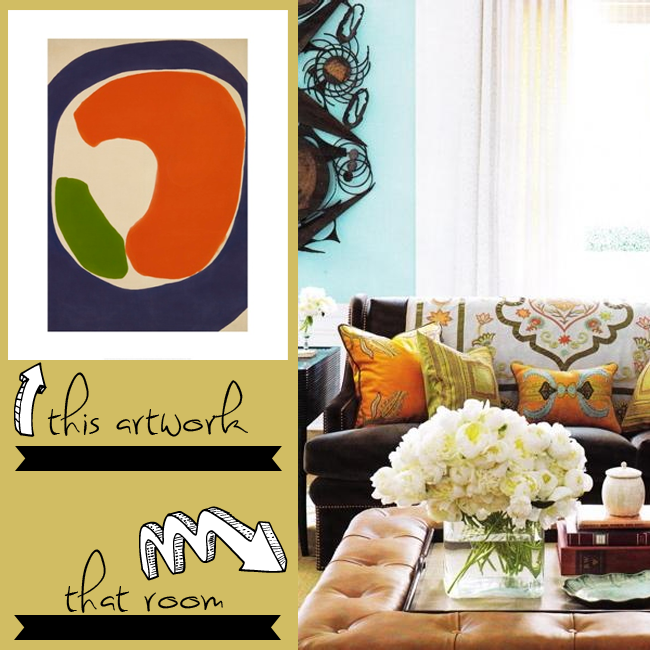 The colors are seaside, but the style is exotic. Room found at The Great House at Greystone Estate, an unoccupied mansion which recently blossomed under the care of some of the most distinguished interior and landscape designers in the industry via Veranda. Artwork: Artist Mario “nerosunero” Sughi explores biking’s introspective powers in this archival, bamboo print titled, Escape/Blue Landscape via UGallery. Mario explains that he sees his chic biker in the midst of “crossing an abstract landscape both physically and mentally.” She moves from chore to chore with shopping bags in tow and a mind buzzing with activity. Room: Leather edges and a lift-out tray let the Tray Chic Ottoman multitask as table, bench, and footstool. The Nailhead Sofa is in solid velvet, so patterned throws and pillows can easily change its look. All textiles by BeeLine Home. Curtains made of Indian bedspreads frame an urn from John Rosselli Antiques & Decorations. The room is verdant, lit and very 1970’s in its color palette. Avocado mixes nicely with caramel brown and orange peel. Image by Thomas Loof, via House Beautiful. Artwork: A reproduction of Jules Olitski’s Purple Golubchik from1962 via Artriver. Olitski was an American abstract painter, printmaker, and sculptor. His modern art is known for its brilliant colors, dynamic movement, unexpected harmonies and chromatic shifts. The print almost seems to be moving, tumbling, spinning. THE BEST PART of modeling an entire room after the aforementioned artworks? They are all affordable prints at under $100 each!